Maria Callas was an American born Greek soprano and one of the most renowned opera singers of the 20th century. Critics praised her bel canto technique, wide-ranging voice and dramatic gifts. Her artistic achievements were such that Leonard Bernstein called her 'The Bible of Opera' and her influence was so enduring that, in 2006, Opera News wrote of her: "Nearly thirty years after her death, she's still the definition of the diva artist, and still one of classical music's best selling vocalists." 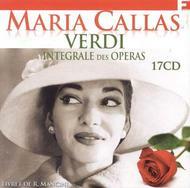 This beautifully presented 17 CD set (at a budget price) of Verdi 'live' opera clearly demonstrates her true vocal style and why she is still so highly regarded.